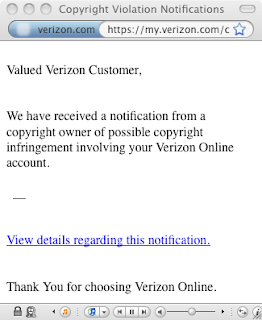 Todd's notes: possible copyright infringement involving your Verizon Online account. possible copyright infringement involving your Verizon Online account. We have received a notification from a copyright owner of possible copyright infringement involving your Verizon Online account. View details regarding this notification. Thank You for choosing Verizon Online. There are no details though, the system can never" access them at this time".